[by Ron Rolheiser OMI; 2004] Lent is that annual journey taking us into the depths of God’s mystery. For many who must juggle life’s daily demands, the season often seems to pass by quickly with little opportunity for spiritual growth. 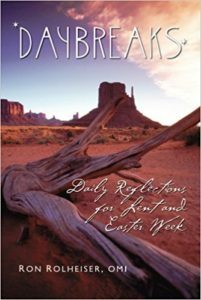 But in this booklet, renowned spiritual writer Father Ron Rolheiser provides reflections for each day of Lent and Easter week that are short and clear enough for the busy person, yet provocative, and challenging to the heart of one’s being. Begin each Daybreaks meditation by finding a quiet place where you can be calm and peace-filled in the presence of God-at least for a few moments. These reflections will not take long. You need only enough time to let these written words sink in and inspire your own thoughts. How will you apply them to your own life? Do they spur you on to make some specific type of change in your life, your attitudes, or your behaviour? That is the process of conversion. That is the journey of Lent and Easter.